In 2008, there was a call to create five million “green” jobs. Ten years later, where are we at? What are some examples of green jobs in 2018? How many jobs are there? We’ll dig into these questions and more. But first, let’s define a green job. What is a “green” job in 2018? A job that helps produce a good or service that benefits the environment or conserves natural resources. This good or service could be renewable energy, pollution reduction, an organic product, or environmental compliance. A job that involves reducing the environmental impact of an organization’s production processes. Responsibilities might include establishing cost-cutting initiatives such as energy efficiency, renewable energy sources, waste management, or resource conservation. These jobs exist in emerging green sectors and in traditional sectors such as manufacturing, technology, insurance, and state and federal government. 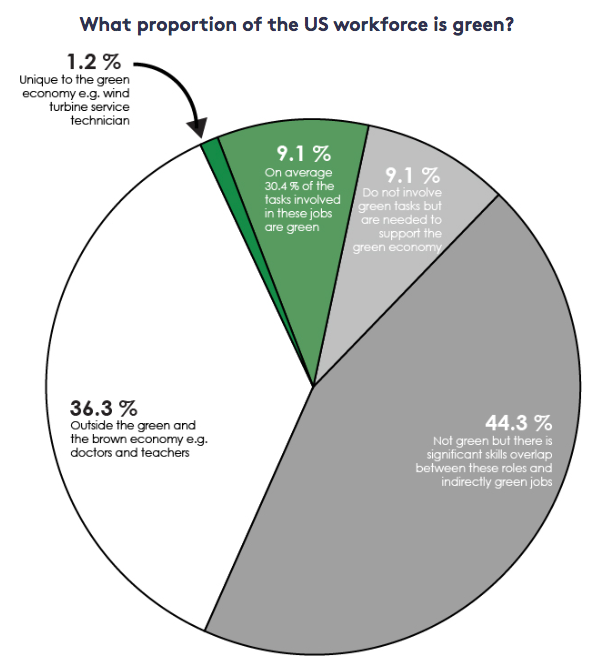 It’s been estimated that one percent of the U.S. workforce is employed in green positions. But a 2018 paper published in the journal Energy Economics suggests that the number of workers with jobs that are partially focused on environmental tasks is much higher—around ten percent. What are some examples of green jobs? What does a sustainability specialist do? S/he addresses organizational sustainability issues, such as waste management, green building practices, and green procurement plans. What does a climate change analyst do? S/he researches and analyzes policy developments related to climate change and makes recommendations for legislation, awareness campaigns, and fundraising approaches. What does an energy auditor do? S/he conducts energy audits of buildings, building systems, or process systems. What does a chief sustainability officer do? S/he communicates and coordinates with management, shareholders, customers, and employees to address sustainability issues and enact a corporate sustainability strategy. What does an environmental economist do? S/he conducts economic analysis related to environmental protection and use of the natural environment and quantifies the benefits, costs, incentives, and impacts of alternative options. Green jobs or sustainability jobs? Green jobs are very much a central and growing piece of the modern economy. More than 3.2 million people are employed in clean energy in the U.S.—that’s 2.5 times more than those employed in fossil fuels. Wind and solar are the two industries propelling this job creation. The U.S. Bureau of Labor Statistics predicts they will be the two fastest growing sectors through 2026. The current line of thinking, outlined well in the book Strategy for Sustainability: A Business Manifesto, is that green initiatives alone aren’t broad enough to sustain most businesses long term. But those that take into account environmental and social issues will thrive and lead. How are sustainability jobs different? Green jobs largely focus on reducing environmental impact. Sustainability jobs involve balancing the triple bottom line—people, planet, and profit. Sustainability professionals constantly have these three things top of mind, focusing on the bigger picture and how their organizations fit into and impact communities and the environment. See the 2017 average national salaries and recommended education for specific positions on the U.S. Bureau of Labor Statistics website. How do I get a green or sustainability job? To become a sustainability professional, you should have a broad education in three main disciplines: business strategy, economics, and environmental science. You’ll also need knowledge and skills in several subdomains, such as marketing, accounting, law, communication, and management. A degree in sustainable management provides this education. University of Wisconsin offers an online bachelor’s degree and master’s degree completion program with a curriculum that covers all of the above. You can explore the UW Sustainable Management bachelor’s curriculum or master’s curriculum now. It’s crucial that your resume shows experience building and implementing sustainable initiatives. This isn’t as intimidating as it sounds. Many students in the UW Sustainable Management programs start with small initiatives in their workplaces and grow from there. Also, every student must design and complete a capstone project at a real organization. The capstone provides an opportunity to put all the passion and skills you built in the degree program to the test. Plus, it’s a networking opportunity that can lead to job opportunities. Which companies are focused on sustainability? Private companies and state and local governments are adding more emphasis on corporate sustainability initiatives such as greening supply chains, adding renewables, and reducing waste. 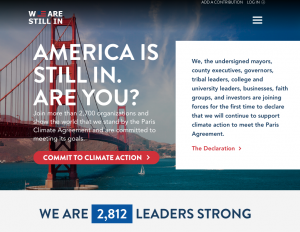 We Are Still In is a coalition of more than 2,500 governments and businesses that have pledged to remain committed to the Paris Climate Agreement. If you’re looking for local organizations that value sustainability, this is a good place to start. You can search by sector or state. For example, in Wisconsin, Johnson Controls, Dane County, Fiskars, and Kohler Co. are among the signatories. 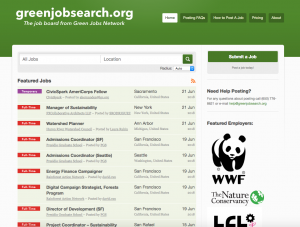 You can also search for current openings on the Green Jobs Network. Start exploring how you can get involved in sustainability with the UW Sustainable Management programs. Or, continue learning about the sustainability field.